My tasty lunch on Monday was designed to use up the molé enchilada ingredients. 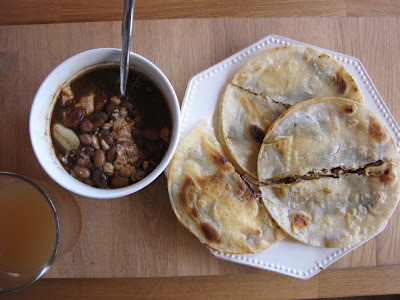 Pinto beans with just a touch of molé added and queso fresco, and quesadillas with goat cheese and more molé as a filling, accompanied by spiced apple cider. Totally simple and spicy. Delicious! Will you share your molé recipe? Pretty please?! I DO NOT make molé from scratch! That would take hours. Seriously, its like a huge process of charring (for black molé that is) many ingredients from bread crumbs to nuts to chiles and fruit, and then blending them together. (As I'm sure you know). Someday I'd love to take the time, but until then I use pre-made molé paste. The paste that I was just using up was actually purchased at one of the market's in the city of Oaxaca and carried back in my mom's suitcase. She's been in Oaxaca again and will be bringing back a new batch, so I felt okay using up my molé stash. Otherwise I hoard it in the freezer because it is so much better than any of the pastes that I can get here. That being said, even the random molé paste that you can buy in a jar at the supermarket is pretty good-- and they make and sell it at the new-ish Pro's Ranch Market-- I need to try it. To prepare it from a paste, what I do is dice an onion finely, sauté it in oil, add about a half cup of mole paste and a can of crushed tomatoes, and chicken broth until it reaches a saucy consistency. Then I add in chicken pieces that I've already browned, and simmer for at least an hour. The flavor deepens as it cooks. toasty, spicy foods are the best in the winter.